Women’s Spaces Radio Show on KBBF-FM 89.1 with host Elaine B. Holtz with a Commentary and guest Evelina Molina on Leones en Accion, broadcast on 6/29/15, has been uploaded to the web archives. Guest 2. Evelina Molina discusses her path as an activist to entrepreneur and secretary of the newest Lions International Club: Sonoma County Leones En Accion (Lions in Action) , a bilingual club in Santa Rosa – Roseland. 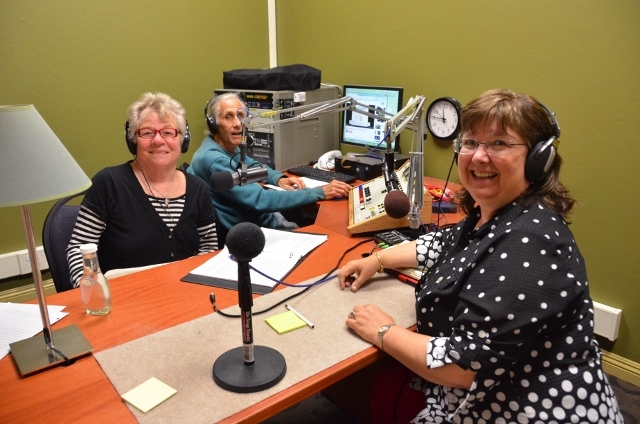 Women’s Spaces Radio Show on KBBF-FM 89.1 with host Elaine B. Holtz and guests Santa Rosa City Council Member Julie Combs, broadcast on 6/22/15, has been uploaded to the web archives. Guest 1: Julie Combs discusses Santa Rosa City Council meetings to come on affordable housing and rent control. She reports on the event Coalition for Grassroots Progess in Petaluma last Saturday, at which she was the MC and former Mayor and now City Councilwoman of Richmond Gail McLaughlin and political author Norman Solomon were featured presenters. Women’s Spaces Radio Show on KBBF-FM 89.1 with host Elaine B. Holtz and guests Kandis Nelson on Juneteenth Celebration and Roberta Teller on storytelling for Boomer women, broadcast on 6/15/15, has been added to the Radio Archives. 2. Roberta Teller , KOWS 107.3 FM Radio Show Producer of Wise Woman Storytelling. Music Break: The Changer and the Changed, Chris Williamson (from the CD album The Changer and the Changed) © 2005. Guest 1: Kandis Nelson discusses Juneteenth Celebration and its history since 1865 when Black Americans in Texas were first informed of the Emancipation Proclamation two years after President Lincoln’s declaration. Juneteenth has been an annual event in Santa Rosa since 1979, and occurs this Saturday beginning at 10 AM at Martin Luther King, Jr. Park on Hendley Drive adjacent to the fairgrounds. Sports events for the kids begin at 10:30AM. Kandis formed a discussion group for participants to better understand the collective and personal history of African Americans. All open-minded people are invited to the monthly Heru Network meetings held at the Sonoma County Peace & Justice Center, Santa Rosa on the 2nd Tuesday of every month from 6:30 – 8:00 pm. Music Break: Waterfall, Chris Williamson (from the CD album The Changer and the Changed) © 2005. Women’s Spaces Radio Show on KBBF-FM 89.1 with host Elaine B. Holtz and guest Tamara Klamner of SEVA Foundation and Helen Caldicott MD on our “sleepwalking toward annihilation”, broadcast on 6/8/15, has been added to the Radio Archives. 2. Dr. Helen Caldicott , MD, Author and activist on nuclear and environmental dangers. Music Break: Shooting Star, Chris Williamson (from the CD album The Changer and the Changed) © 2005. Guest 1:Tamara Klamner talks of her production work with the Seva Foundation and her own companty Tapestry Productions. Her last event celebrating Wavy Gravy’s 79th birthday in Rohnert Park raised over $160,000 for the SEVA Foundation, that restores sight to the blind in Nepal since 1979. SEVA Foundation also raised over $800,000 for relief from the large earthquake that recently hit Nepal. Music Break: Sister, Chris Williamson (from the CD album The Changer and the Changed) © 2005. Women’s Spaces Radio Show on KBBF-FM 89.1 with host Elaine B. Holtz and guest Lilith Rogers on Rachel Carson Returns and Elaine’s Commentary on the $93 Billion War budget, broadcast on 6/1/15, has been added to the Radio Archives. Women’s Spaces presents: Iron Jawed Angels Film Showing in Santa Rosa at the KBBF Hall on Wednesday June 24, 2015. Guest 1: Lilith Rogers announces the next presentation of her one-woman play Rachel Carson Returns at St. John’s Episcopal Church in Petaluma from noon-3 on Saturday June 6, 2015 and how she was inspired to write the play. EDITOR: What? Ninety-three billion dollars allocated for the military in the so-called balanced budget? Who are we as a nation? Are we a nation that values life or promotes death? Recognize who is going to suffer — our children and their future. What will they inherit? Endless wars, disease epidemics due to lack of medical care for all, under-education due to the trashing of public education, hunger as food prices rise and food stamps are cut for those who need a boost and, sadly, the elderly sleeping on the streets because Social Security has been destroyed? Wait a minute. We are fighting for the fetus and, at the same time, killing children already born in other countries and on the streets of U.S., and it is all justified and budgeted. It is interesting listening to candidates who let us know how they support the military and agree with the cutting of social services. Oops, be careful. I forgot social services means socialism. A good slogan this election cycle: profits over humanity. I ask again, are we a nation that values life or promotes death? Take the Women’s Spaces Pledge! Lyn Cessna, Women’s Spaces intern, speaks about the Pledge’s influence on her life.